Most people focus on MOP gems these days, but don't forget that not everyone is level 85+! For some gold making tips there's not even prospecting required, saving you a lot of time! After this gold making tip, you have plenty of time to try some other Jewelcrafting tip out. Next up it's time to reveal how to make gold in Pandaria, so keep an eye out! I like this method, because not even prospecting is required. All it takes is a few minutes a day, assuming you have the correct jewelcrafting designs available. Getting these designs may take a while if you're a fresh jewelcrafting, but you can also stick to green quality gems. The goal is simple. Visit auction house, and search for "Ruby". The result should be something like this, if you use Auctionator. 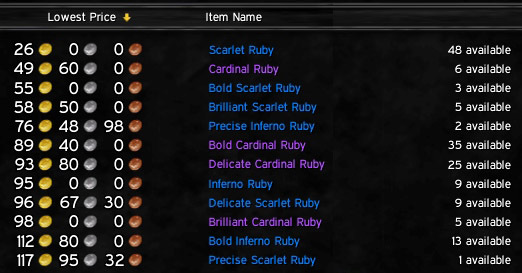 In this example, Scarlet Rubies make the most profit, no matter how you cut them. Items like Precise are the most expensive, but they sell very poorly. It's a good idea to stick to those that have the highest quantity available. Now I would purchase some raw Scarlet Rubies. As each of the variants cost more than the raw one, I would start out by making 1-3 of each, and see which sell the fastest. There's lots of other choices available too. Rubies are just the best sellers from my experience. Try some other gems out too by searching for the uncut gems and then comparing which cut is the most expensive, and if you will get any profit buying the raw gems. Blue and yellow gems are not to be ignored. If you're looking to cut Scarlet Rubies, you need to have some Dalaran Jewelcrafter's Tokens available. These are obtained from the daily JC quest there, and are currency for the different Wrath gems. If you're selling gems in the auction house, there's fees. If you visit the auction house daily, it's a good idea to keep the durations to 12-24 hours to avoid massive fees. People will be undercutting you, so there's not as much gold lost this way.